Hire them. Don't think twice about it. They were absolutely amazing. Our friends who are getting married next year had originally decided to hire a DJ. They left our wedding and booked Live Music Pros that week. Hey Adam and Samantha thanks so much for having us share your special day with us, it sure was fun!! Best band ever. We’ve already booked them for another wedding next year. Many guests told us it was the best band they ever heard. Being with terribly sweet people makes it all that much better! Thanks so much for sharing with us. We got married 12.1.18 and we can’t find the words to say how happy we are with Live Music Pros and Atomic Funk Project!! We went into the city to see them live about 9 months prior to our wedding and at that moment we knew they were the right band for us!! They led us with expert advice! They were easy to get in touch with, communicate with and quick to respond!! About a month later our guests are still talking about our band!! Several guests have asked for their name since!! We asked them to read the crowd and keep them dancing!!! Live Music Pros definitely read the crowd and kept the music going , there was never a dull moment!!! The band was interactive and rocked the night away!! All generations were up singing and dancing all night!!! We highly recommend Live Music Pros and wish there were more than 5 stars to give!! 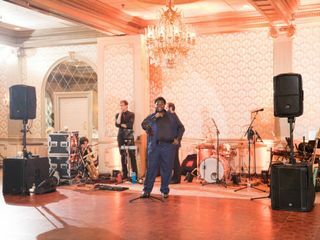 We hired the Atomic Funk Project for our wedding at the Seaview Resort in South Jersey this past October and could not have been happier with our choice. Not only were they accommodating and easy to work with, but were professional and helpful with all my last minute bride questions and detail emails. While I filled out the music request inventory, my main request was to keep the party going and keep the people moving. 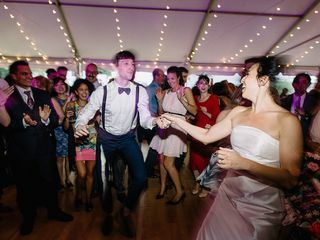 They went above and beyond choosing the perfect set list, a mix of hits new and old that kept our 200 person guest list on their feet and singing along. We originally wanted to play the recorded version of our wedding song (Tennessee Whisky) but when they offered to play it live we decided to go with it. They played it beautifully and we were so happy we changed our mind! I danced with my father to Somewhere over the rainbow/wonderful world by Israël Kamakawiwo’ole which is accompanied by the ukulele, and they were also able to play that version so wonderfully, it had everyone in tears. The only complaint of the night was that people forgot to eat dinner because they were on the dance floor from the minute the reception started to the very last second when the staff had to basically kick us off the floor. Our photos look like a concert venue, the dance floor was packed the entire night and everyone was tearing it up! If you are looking for a live band, AFP is the way to go. People STILL bring them up to us. They say it was the best wedding band they’ve ever heard and the most fun wedding they have ever been to. We could not have asked for a more energetic, get-the-crowd-moving band! We loved that the dance floor was full of guests young and old...no doubt due to the band rocking both the Motown classics and recent hits. We knew we would love the music when we saw the band showcase this past winter but you knocked it out of the park! Hey guys that was just awesome!!! Thanks so much for being a great couple. These guys were top. Extremely professional, very good communication - and the performance was incredible! People were going crazy on the dance floor, I am still getting comments about how great the band was weeks after the wedding. Whole heartedly recommend them! How much fun did we have too?? Lots!! Thank you so much for sharing your day with us, we loved every minute. Atomic Funk Project provided the music for our wedding cocktail hour, ceremony and reception, and the music was on point for each! They were super easy to work with, listened to our preferences on song choices and vibe, and kept the dance floor packed all wedding long. I couldn't have been happier with them! Thank you so much, Kevin! It was a pleasure working with you as well, and we had a BLAST at your wedding! My wife and I got married this past September and we couldn’t be happier that we chose the Atomic Funk Project to play at our wedding. They were so professional and easy to work with and really brought the party to life with their wide variety of talents. From Bruno Mars and Michael Jackson to Frank Sinatra and Billy Joel - they played so many genres of music so well! Everyone was smiling and having a great time, thank you for making our day so special and fun! Also, I’ve never heard a better version of “Shout” and was so happy they ended with that! Thanks for sharing Brian and Amy!! We hope to dance with you again at one of our shows. We appreciate sharing your special celebration with you. It took us over a month to write this review because we just couldn't find the words to describe how incredible Atomic Funk Project was! We are literally beyond speechless: Their energy level literally brought the house down and their talents are just unrivaled! I can't tell you how many guests have asked us who the band was for upcoming weddings in their family. They learned the song for our first dance and performed it better than the original! 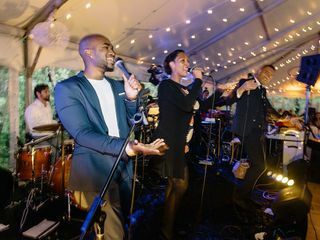 You absolutely cannot go wrong with this band, they will perform beyond your wildest expectations and make your wedding day even more memorable and magical! BOOK THEM! I can't tell you how many guests came up to us and told us it's the best wedding band they had ever heard. We had the most fantastic time and they put on a great show. Highly recommend. AMAZING BAND! We could not be happier with our choice to book Atomic Funk Project. They had our guests, from the little kids to the older adults, on the dance floor all night! The compliments and questions about where we found the band were non-stop. Also, working with them was so so easy. They were very accommodating to our requests, big and small. Would definitely highly recommend booking them to everyone. Thanks so much you two!! We have so much fun with lovely couples like you!!!! We LOVED working with Live Music Pros. We had the 9-piece, Atomic Funk Project perform at our wedding and they blew us away! From the beginning they were super easy to work with. We first went to Brooklyn to watch them in a demo, when we left we questioned if they would be that good at the wedding (because they were so insanely good) and they were! Our performers were interactive with the crowd and made everyone get up and dance. They are so talented, all three singers have an unbelievable range. My mother in-law is a professional singer from Ireland and she wanted to perform a song with the band, and they were more than open to learn the song prior to the wedding. It was an additional detail that meant so much to us. We highly recommend them!! 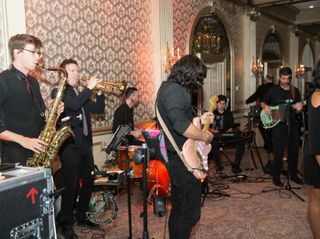 Dave and the entire Atomic Funk Project crew were a fantastic addition to our wedding. It was important to me and my wife to have a great band. AFP was it. First of all, their music catalog consists of a collection of modern pop as well as all the classics. They worked with us to define the musical program throughout the night but noted that the music needs to follow the party. As a musician myself, I appreciated this philosophy immensely. Our wedding was a tricky one. My wife is Dominican and I am Greek/Italian. Half of the guests were traveling from the DR and other counries and so we needed Latin music, as well as traditional Greek. We brought in a DJ duo to cover that stuff and alternate with the band. We were concerned that it might feel frantic given that the reception was only 4 hours long, but thanks to AFP and their on-site musical director, everything went incredibly smooth and they sounded great! Every single one of our guests mentioned how good the band was. A week before the wedding, we decided to add a brass marching band as a novelty experience at the cocktail hour and had them play two custom songs that became our theme songs for the day. We asked AFP if they would mind closing the party creating a version of one of the songs. They were more than accommodating and made it happen. It literally brought tears to our eyes when they started playing it. Thank you, AFP for giving us a night to remember. If you want a band with class, funk, sexiness and a pro sound these are your guys. Highly Recommended! George and Christina thanks so much for sharing your incredibly fun day with us! 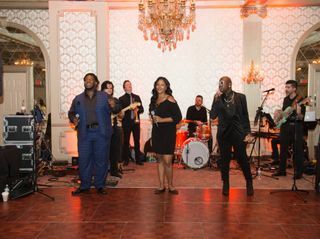 Atomic Funk Project gave an amazing performance and played a huge role in making our wedding so much fun. Would highly recommend them. Thank you guys! Hey Max and Anne, thanks so much for having us share a special couples special day!! Couldn't have been happier with the performance of the The Atomic Funk Project. Played our personal choices great, picked great songs, hit all the notes and really looked like they were having a great time and connected with the crowd which certainly helped keep the tone of our wedding perfect. You can't go wrong with AFP. Emily and Matthew - you were awesome too!! Thanks so much for sharing with us!! BOOK. THIS. BAND. My wife and I saw them a few times at Brooklyn Bowl and thought they were just incredible. They were even better at our wedding. Everyone from our 8-year old cousins to my 70-year old uncle was on the dance floor. The vibe was mega, the set list was perfect, and almost everyone told me that this was BY FAR the best band they have ever seen. simply put, they made the wedding. It was not cheap flying them out to California but it was the best decision we ever made! I cannot say it anymore emphatically. Book this band! Atomic Funk was absolutely incredible at our wedding this July. They were so easy to work with during the booking process, and wonderful to get to know while they were here in Hamilton for our event. We spent almost the entire evening on the dance floor, and I didn't stop hearing about how talented and fun they were from our guests. They interacted with our guests, kept the energy up the ENTIRE night, and made our first dance one we (and our guests) will never forget. I cannot thank Atomic Funk enough for being such an integral part of our wedding day. Hey Britty and Brendan, the entire band and production team had an absolute blast getting to know you. Thanks again we hope to see you again! The Live Music Pros and Atomic Funk Project have truly made our wedding experience extraordinary. We have heard from multiple people from our wedding that this was the best band ever. The wedding had a tremendous energy, and we cannot thank Dave enough for all of what he and his team has done. Hey Joel and Sarah, it was a pleasure being a part of your celebration! Enjoy!! Fantastic experience from start to finish! Everyone raved about our wedding band and loved the music selection! 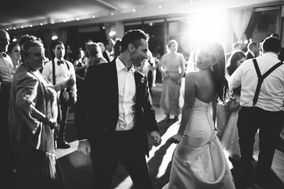 Hey Lauren and Michael, we so enjoyed planning with you and keeping everyone up and dancing! Thanks so much for your kind consideration and the joyful moments that we'll always remember too! We've lost count of how many guests said "this is the best wedding band I've ever heard!" We couldn't agree more. Their energy and talent was unbelievable and they had everyone up and dancing the entire night. We can't imagine our wedding without them!! Hey Sam and Graham, let's repeat!! Thanks for having us as part of your day. WOW! Atomic Funk Project totally blew us away! We searched far and wide for a band and were so excited when we came across their website. Working with Candace leading up to our wedding was super easy and the document we filled out prior to talking to our contact for the evening was very thorough. They were also very accommodating with the special request I had to allow our best friend to sing our first dance song. It's always a little hard to tell in videos if a band is going to meet your expectations and I can say with certainty, AFP exceeded ours. People are still texting us about our band a few months after our wedding. Everyone was dancing all night and the music played was a perfect mix for both ours and our parents' friends. Highly recommend you book them for your wedding asap!!! Thanks so much Sarah! Saul absolutely killed your song and the band loved it! Congratulations again. No need to look any further, Atomic Funk Project is your band. 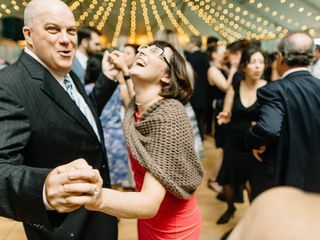 We first saw the band play at Industry City and knew they were right for our wedding as we wanted lots of funk and classics with some new pop thrown in. 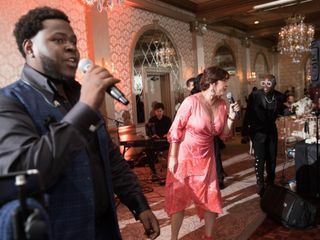 Brandi, Deon’te, and Jonathan were not only amazing singers, they were great performers and bursting with energy. Never have I seen the crowd at a wedding constantly applauding a band mid-songs, but they are just that good. We danced all night. Allie, thanks so much for sharing your special day with us! We had almost as much fun as you did. Hugs! We are SO happy with our decision to book Live Music Pros for our wedding on 4/28/18! The music for our entire day (from our ceremony, cocktail hour, and reception) was completely perfect and we got countless compliments from our wedding guests who said it was one of the best bands they had ever seen play at a wedding! The majority of our guests were on the dance floor the entire night, which is exactly what we wanted. We wish we could go back and do it all over again!!!! Hey Roxanne and Richard thanks for letting us share your special day! If you want the A-team, look no further. We booked Atomic Funk Group for our ceremony, cocktail hour and reception, and they were everything we could’ve hoped for and more. We had 200 guests, with ages that ranged from 19 to 80, and wanted a versatile band that everyone would enjoy. Atomic Funk played everything from Motown to top 40s, and most importantly, had everyone up and dancing the entire evening. At the end of the night no one wanted to leave the dance floor, and in hindsight, I wish we would’ve paid for an extra hour just so we could’ve kept the party going with them. Our guests are still raving about how much they loved the band and how great they were. Atomic Funk was extremely easy to work with leading up to the wedding; they were accommodating and always responded to emails right away. We cannot wait to see them perform again, since all our friends are already lining them up for their future weddings. Do yourself a favor and lock them in for your wedding - it will be the best money you spend. Hey Corrine and Brandon, thanks so much!! We had almost as much fun as you did! Hugs.